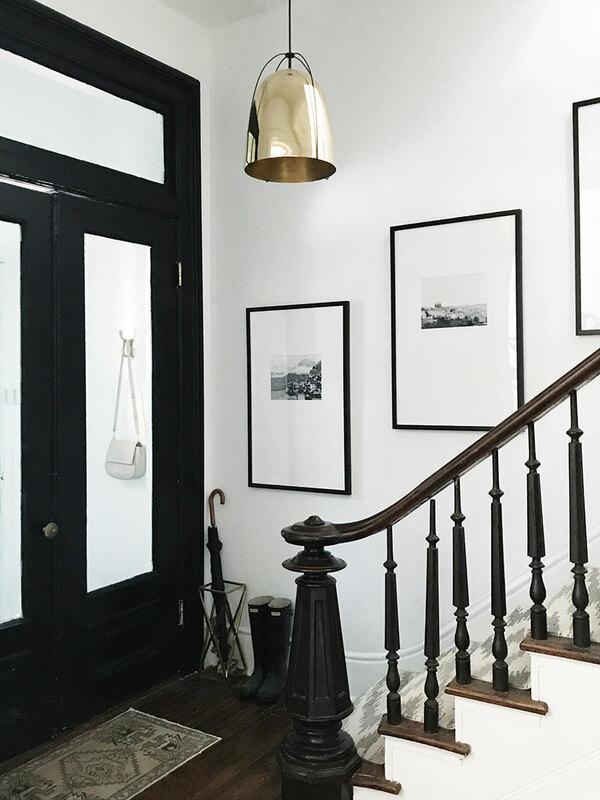 Here it is – our entryway! 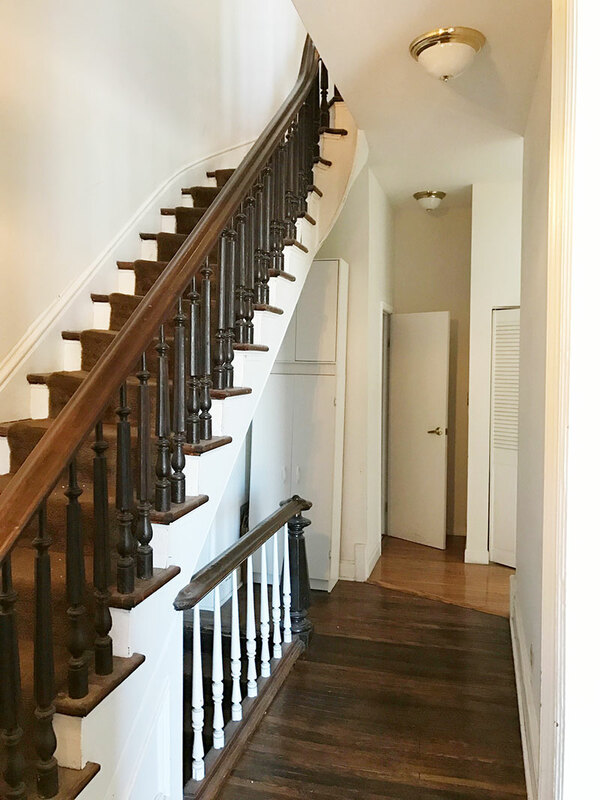 I absolutely love this space with it’s original 1887 staircase (that our guests sometimes question will collapse as they near the top… we don’t think it will!). 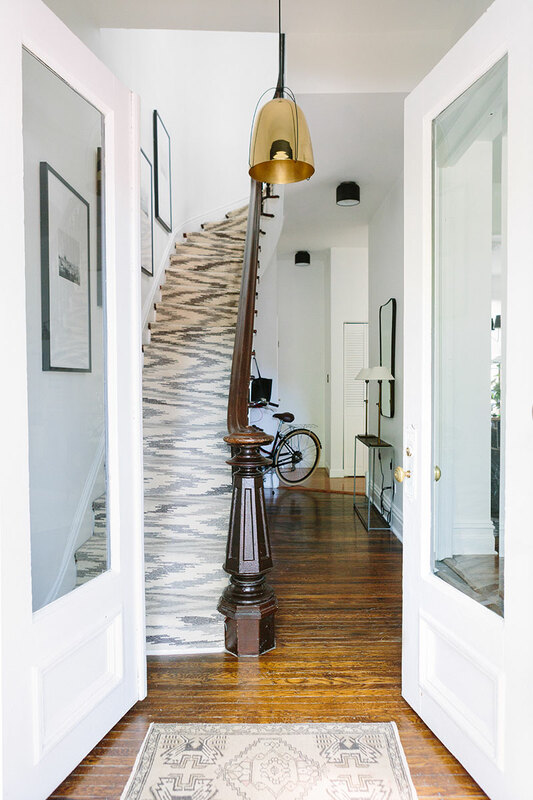 I love the long banister and the curve at the top of the stairs. 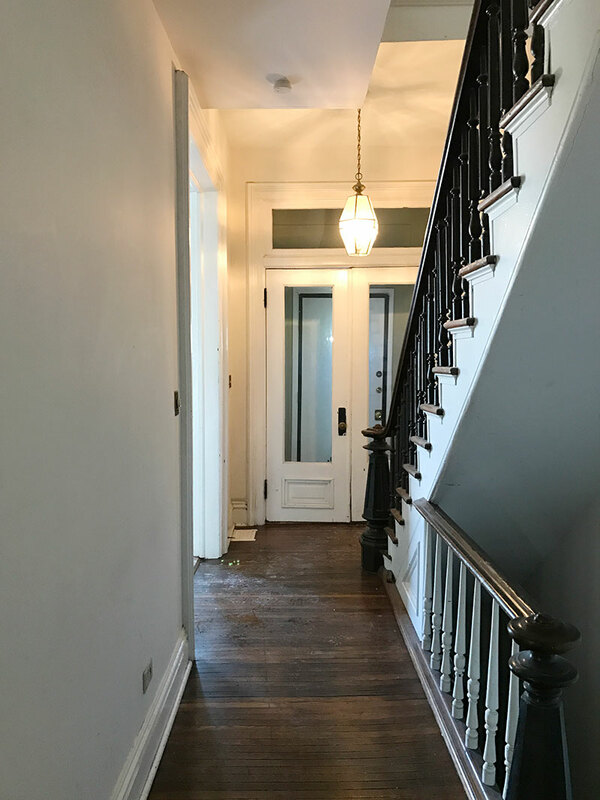 And the vestibule right when you walk in keeps so much of the cold out in the winter. 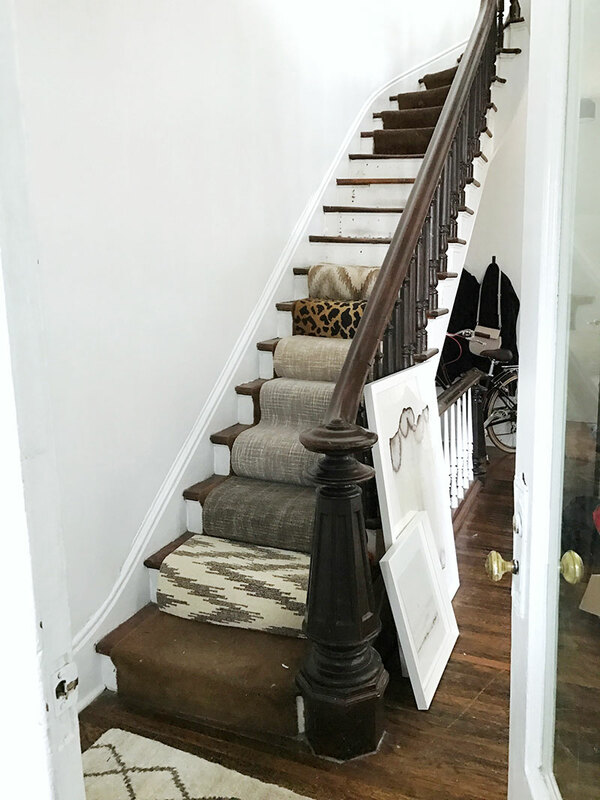 That being said, this room in the home is definitely the one that NEEDED the most work – mainly the stair runner. 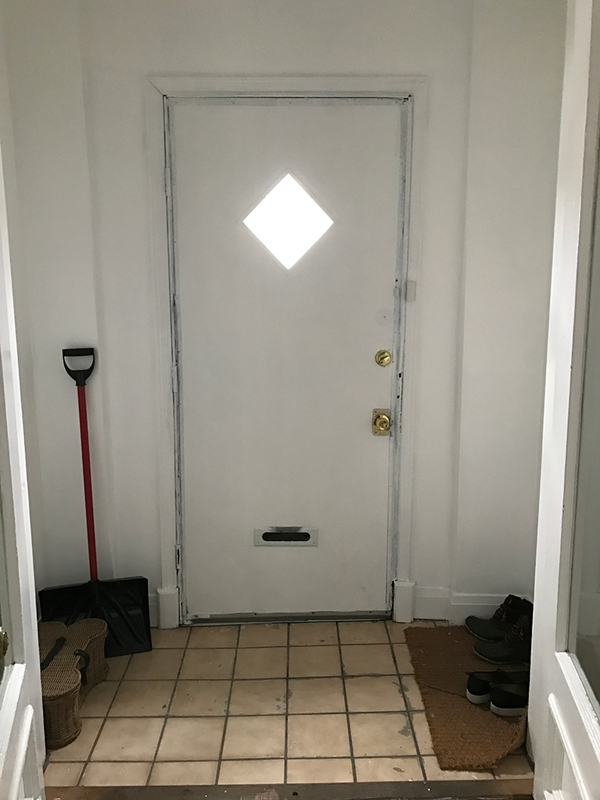 The tile in the vestibule was sad but I address further down in the post that was a personal choice to change it, not a necessary one. Above are photos as the place was when we looked at the apartment! 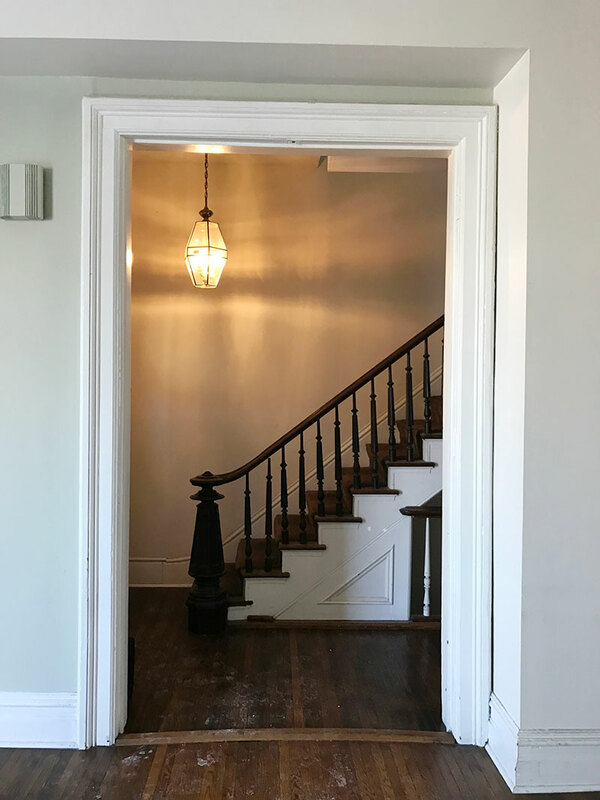 The landlord had every room painted, but I got to choose the color – Behr’s Ultra Bright White in an eggshell finish. 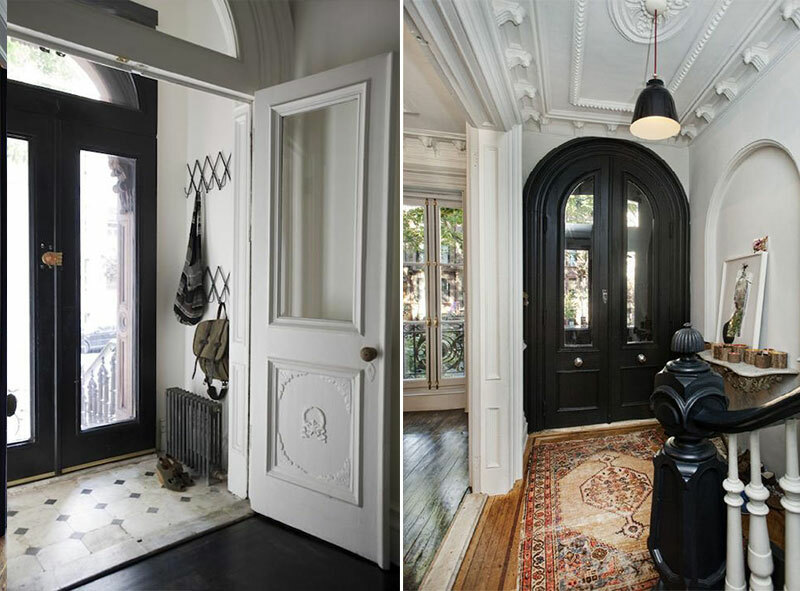 Above are a few photos I pinned of Brooklyn brownstone entryways, including Jenna Lyons’! 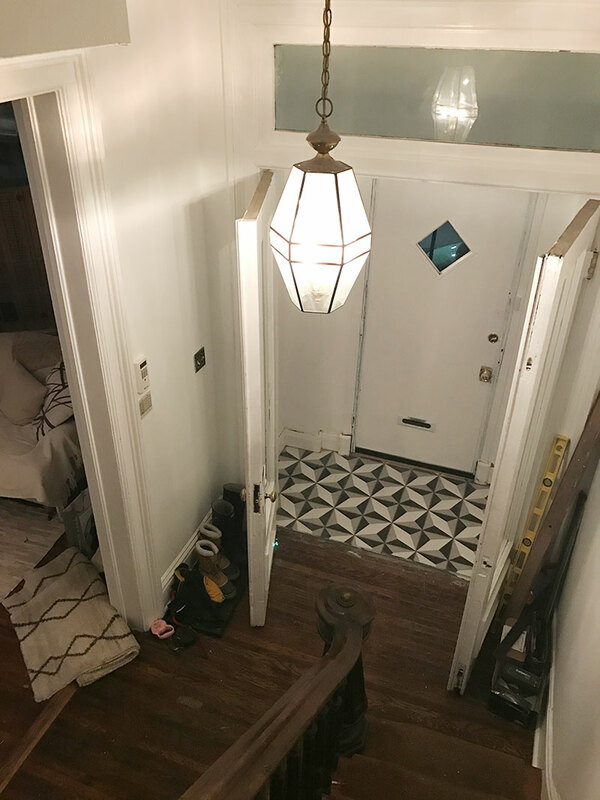 I knew I wanted to paint the doors black, art going up the stairs, an entry table to gather keys and odds and ends, a grey rug in front of the doors, awesome new lighting, and a new runner. 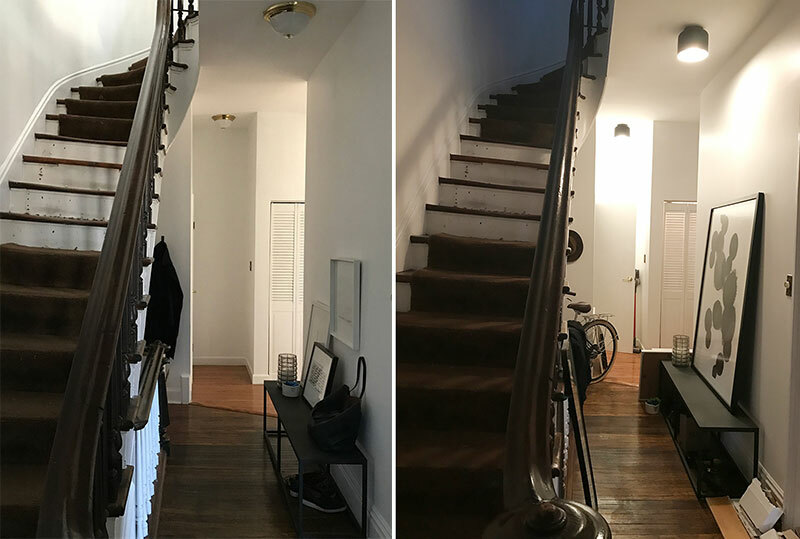 This was the only real “renovation” in the home that we did. 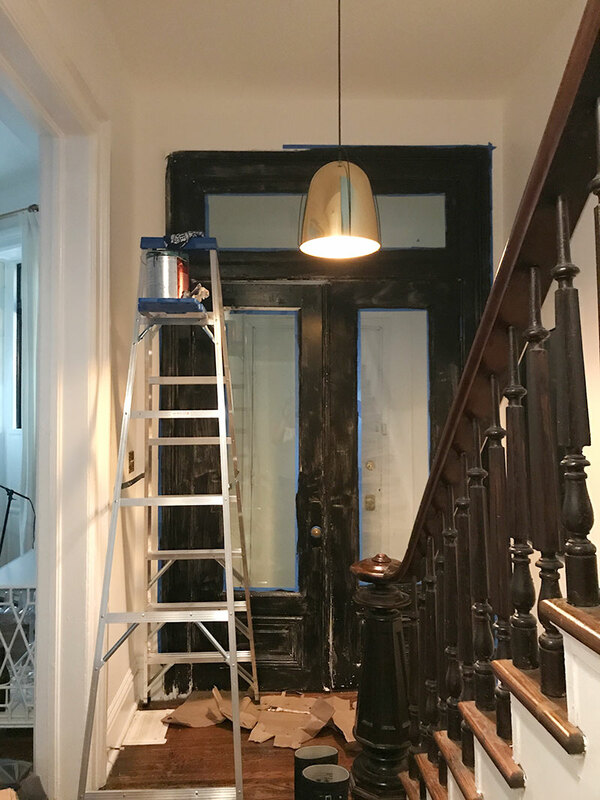 (I don’t consider changing lighting or painting the doors renovating, because well, it’s not.) 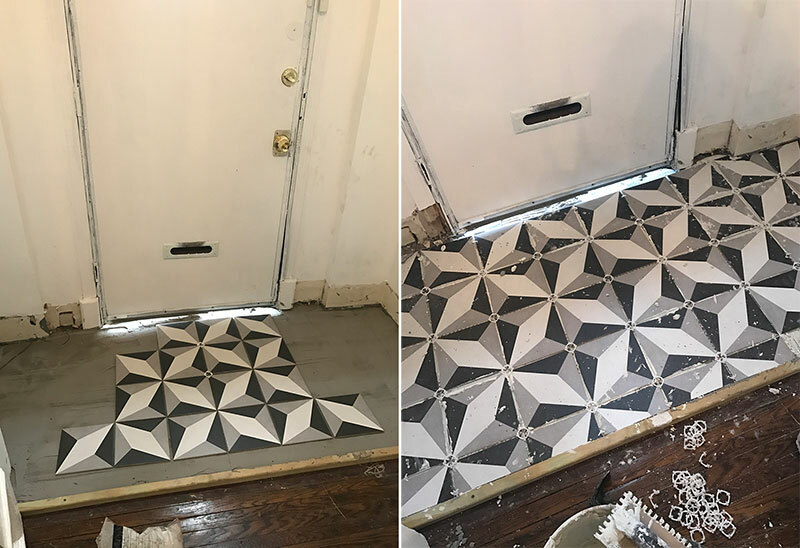 Everything else could have been DIYed if we were handy enough… there was no way we could have done this tile job, and I think it even took our handyman way longer than he expected. 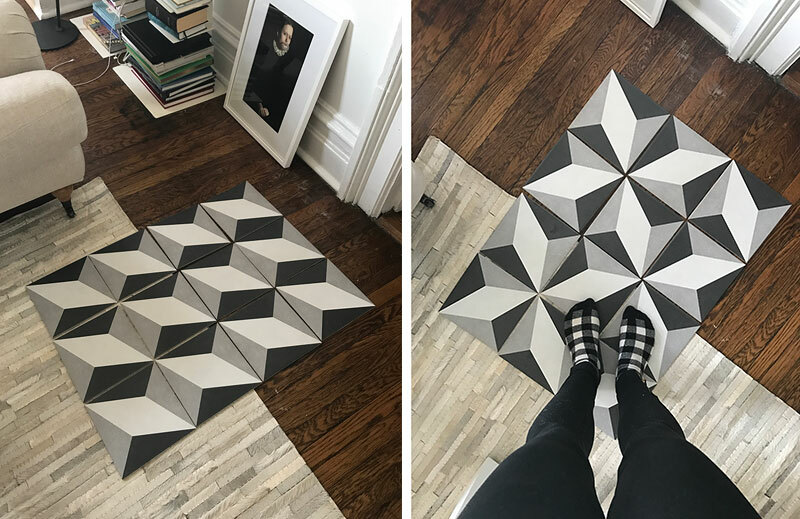 Wayfair generously sent the geometric tile and we paid the fee for the handyman to install it… considering it’s the first thing I see when I (and guests) walk in the house, it was worth every penny. Just scroll up and look at the before again and try to tell me otherwise. I dare ya. 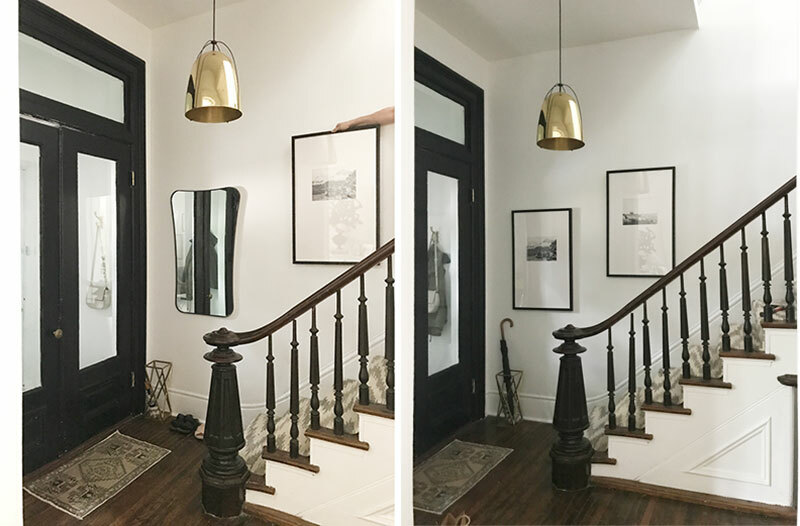 I go into FULL detail with my design process photos and before/afters in this post. But changing out the runner was always going to happen, wether I got inexpensive fiber runners from Ikea and attempted to install it myself; or in this case, got to use a lovely wool micro-hooked rug from Dash and Albert and had our handyman do it. The previous runner was unlivable, and I’d likely have chronic sinus infections from the dust and dirt in the previous runner. I’m seriously not exaggerating. It flew into my face when I started tearing it up, it was so so so bad. 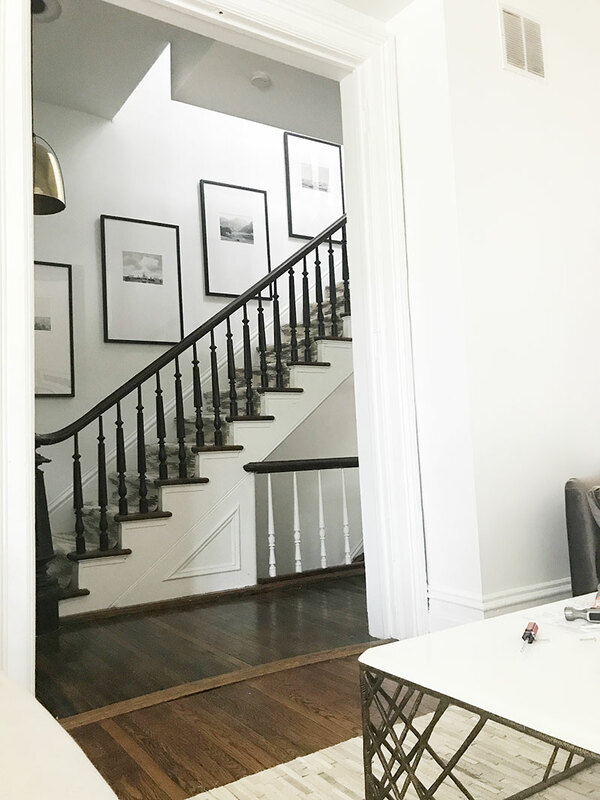 I originally hung our mirror but as you can see, that got moved when I opted to add the large matted frames going up the stairs! 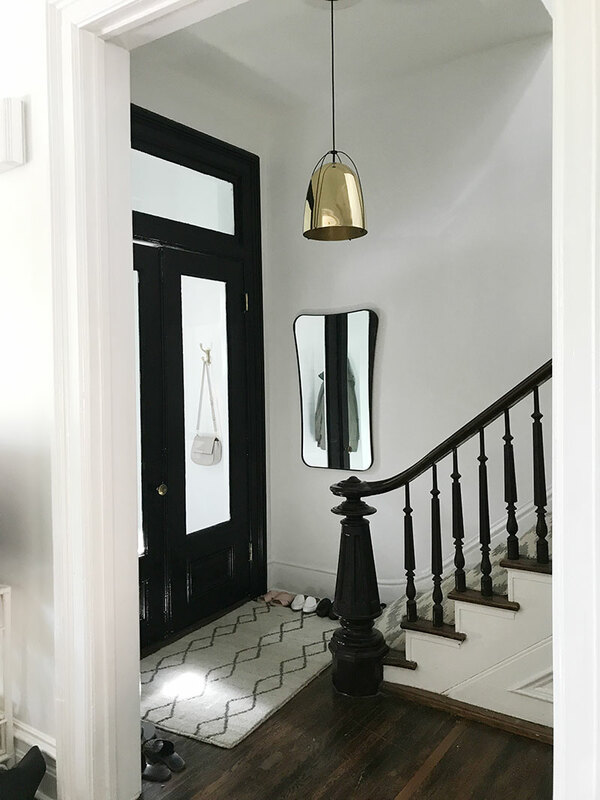 The new pendant from Rejuvenation was an amazing change – and I already knew I had plans to paint the door black so the gold pendant would pop! I know everyone is going to ask me but I unfortunately don’t remember this black paint color. I assume it’s the darkest black Behr offers and it’s in a high gloss finish! This took me 2-3 hours to do one night with Friends on in the background. Which is how I usually work. 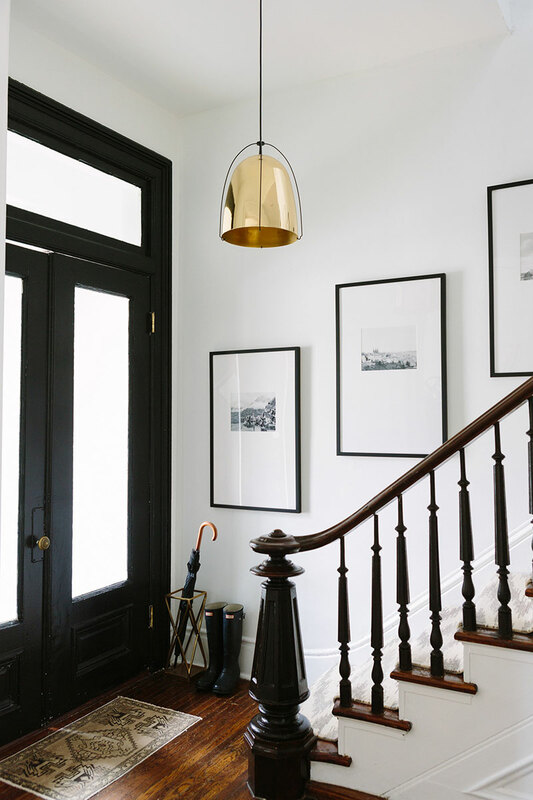 I partnered with Framed and Matted on these amazing frames, inspired by this photo from Studio McGee. I just used an online printing company to print blacks and white photos from our trips. So here it is! 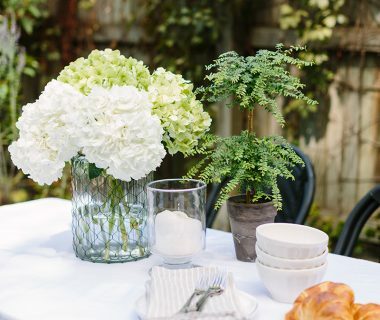 As photographed by Aimee Mazzenga for The Everygirl. 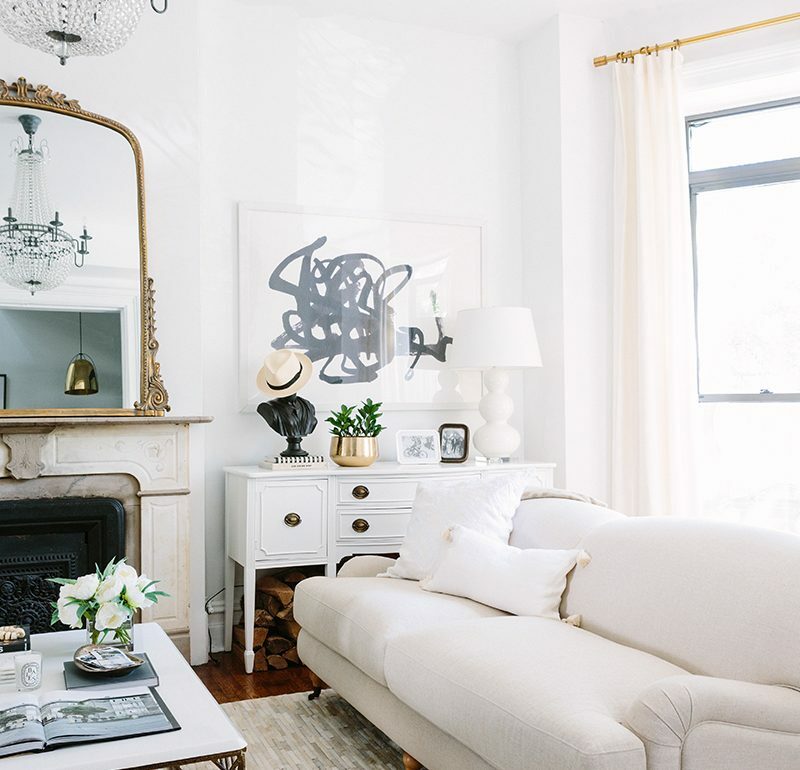 See our living room before and after here! Amazing transformation! 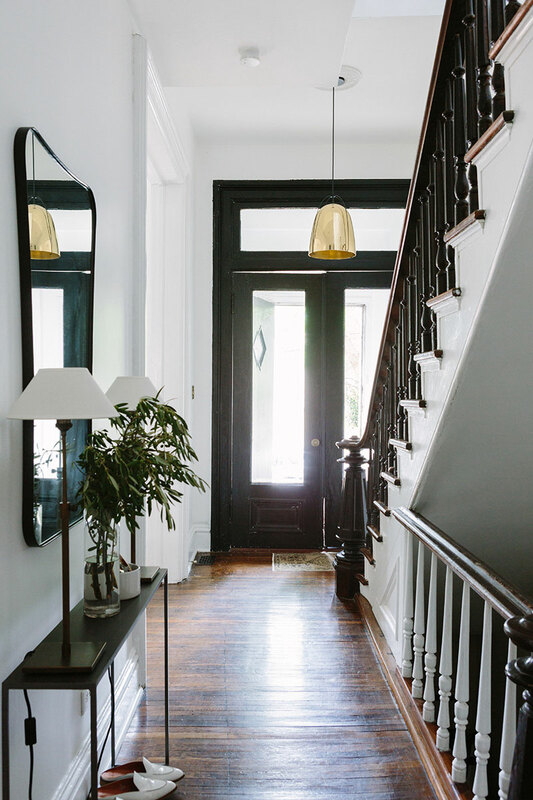 So warming and welcoming – which is perfect for the first thing you walk into in the house! 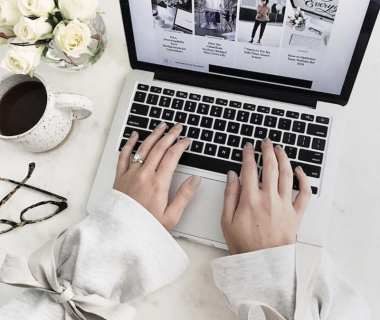 Thanks so much for sharing – loved seeing the progress unfold! Such a transformation! 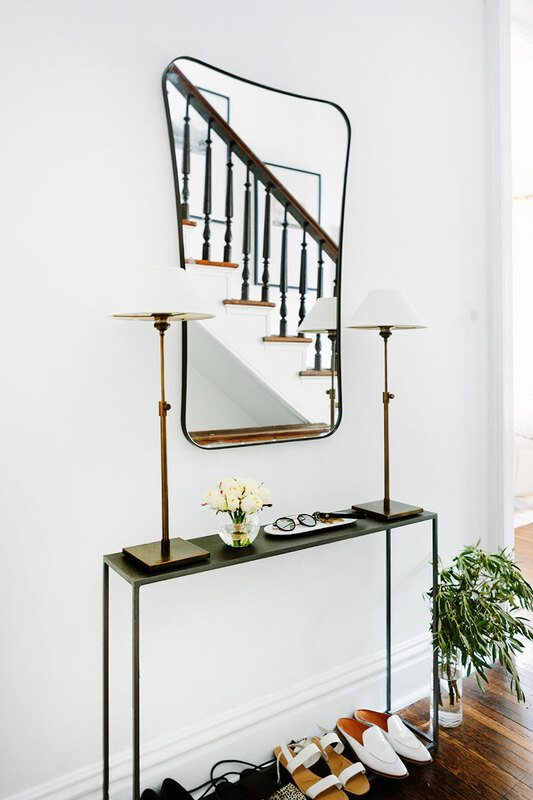 Could you share how wide the hallway is where you have the console table? 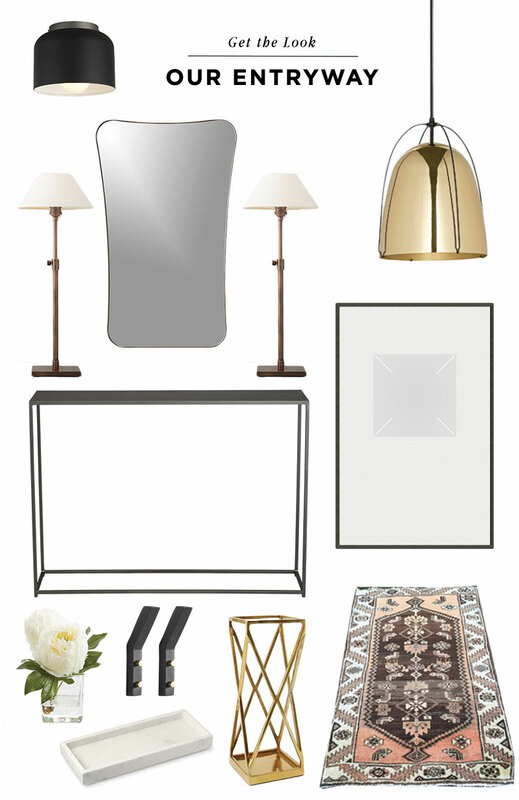 Trying to decide if this would work in my space! 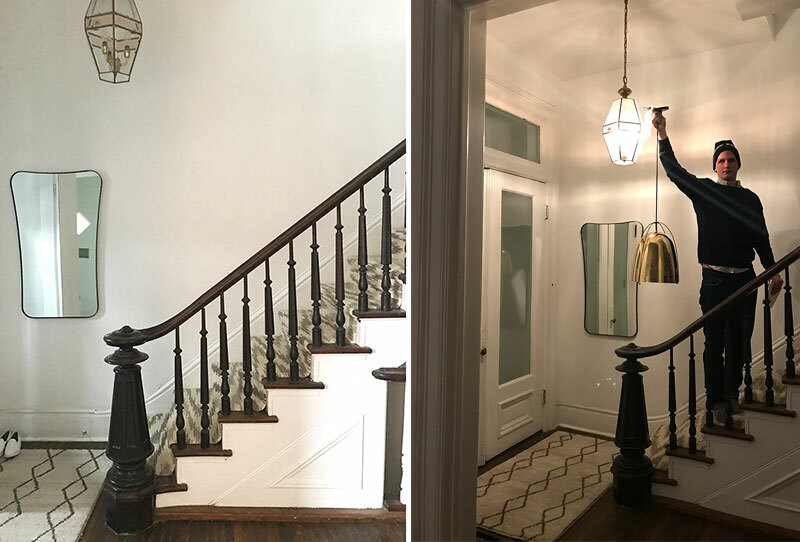 Love seeing your transformation projects! 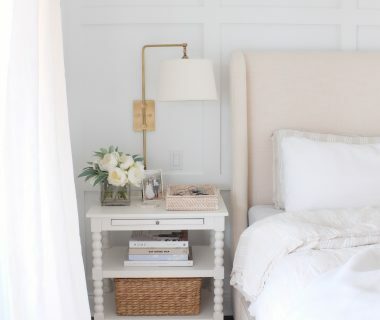 Looks amazing – serious inspo for my home! Lovely transformation. 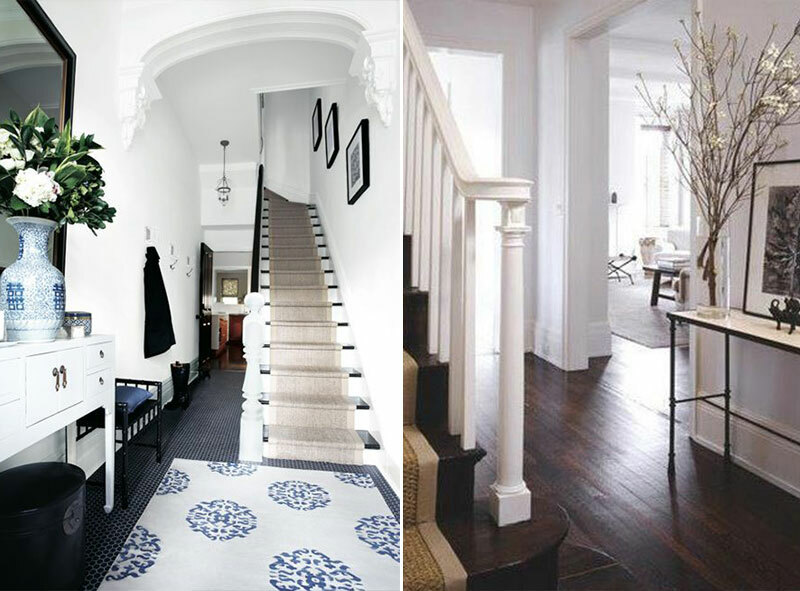 Definitely inspiration for my home! Hi! 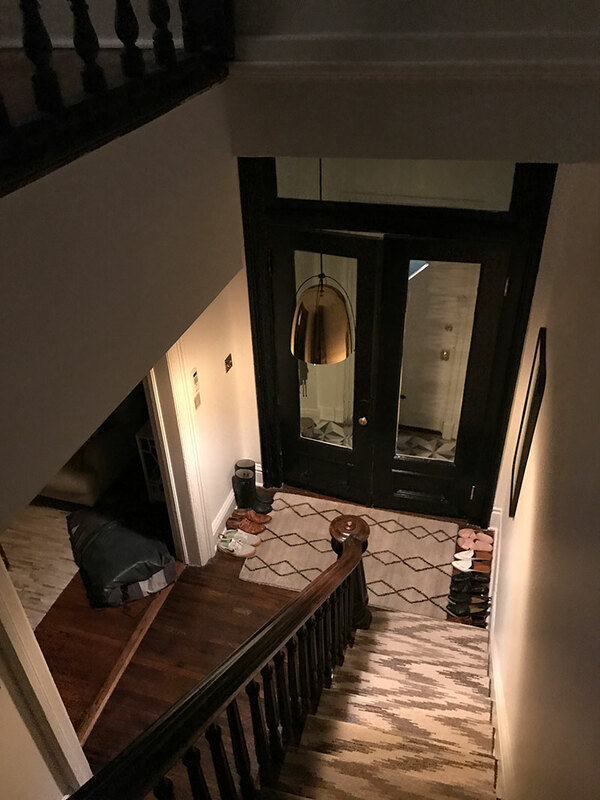 I LOVE your house (was first hooked from the Everygirl post), I noticed you never say anything about the stairs that go down. Where are they going?? 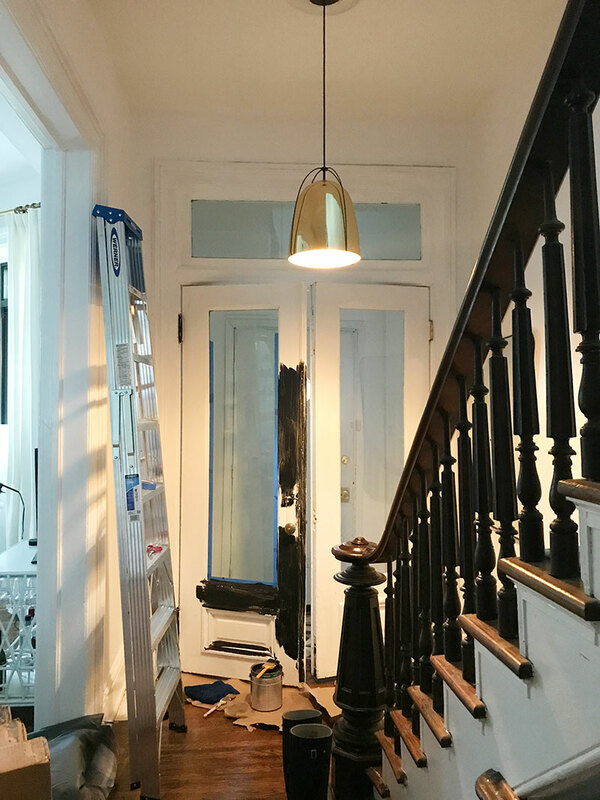 I came to your site via Jen (Rambling Renovators) and I’m amazed! 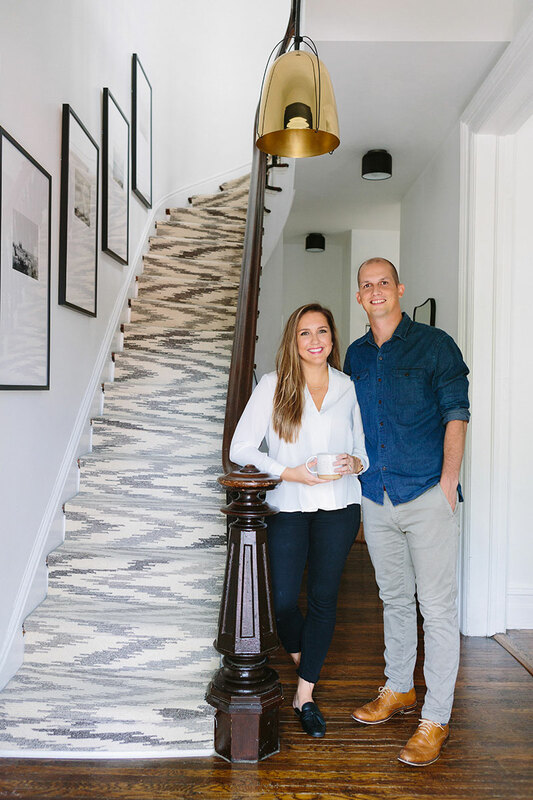 Your home is gorgeous, and I’m so glad you’ve posted messy pics of your reno process. I love seeing those bits, too, along with the pretty stuff! Hello! 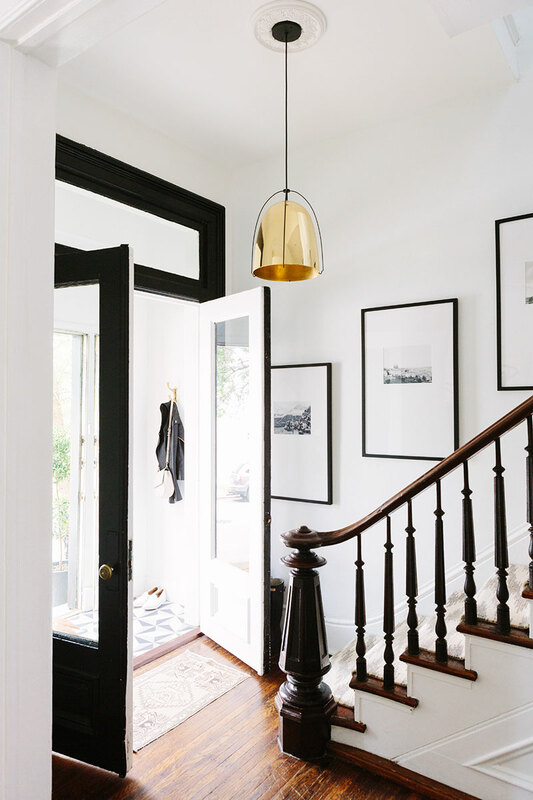 Could you tell me what size your photos/and or frames are in the hall? There are so many choices and I love the spacing of yours! 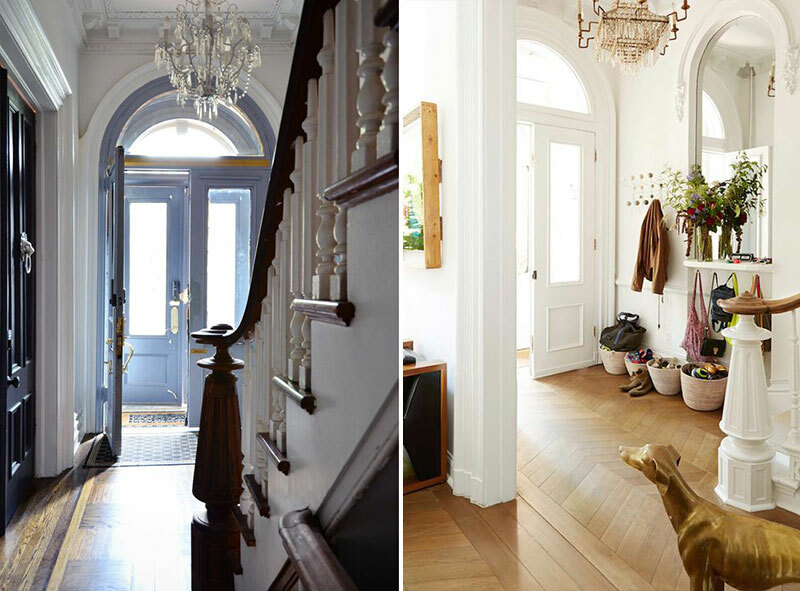 What a beautiful home you have created, obviously you have a great eye for design. 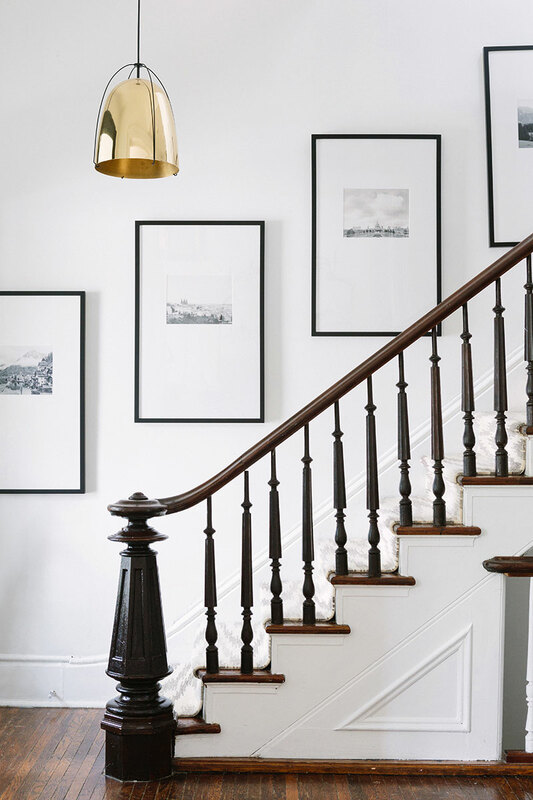 Can you please share the dimensions of the black frames with white matting that you have going up your staircase? I have had bare walls for far too long and this is my inspiration! Also what size of print/art did you put in?